American voters appear to be looking for a softer immigration policy than has sometimes been proposed by Republican presidential candidates, with a new poll revealing that even most Republican voters in the United States would vote for someone who stops millions of undocumented immigrants being deported. 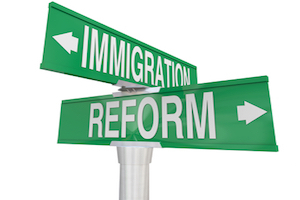 Most Republicans still want President Obama’s executive action on immigration reform to be reversed, according to the poll from the Associated Press-GfK; however, the great majority would still be happy to vote for someone who would keep the essence of this policy firmly in place. The poll, which was taken this week before potential Democrat presidential candidate Hillary Clinton attempted to make a meal of the gap in policy between allowing immigrants to gain US citizenship or just legal status, indicates that most people do not see any real difference between the two. “This country has always had open doors,” says Seattle Republican Dean Talmadge. “I don’t just have a problem with immigration, as long as they are here, working and following the rules.” The poll reveals that the great majority of Americans agree with this sentiment, with 53% in favor of offering undocumented immigrants a path to US citizenship versus 44% opposed; meanwhile, 50% favor just legal status versus 48% against. Most of the current Republican presidential prospects agree with allowing undocumented immigrants to remain in the United States while trying to gain legal status, though none have yet agreed with offering citizenship.